Home iPad What’s So Good About iOS 5 iMessage? So WTF does iMessage do? 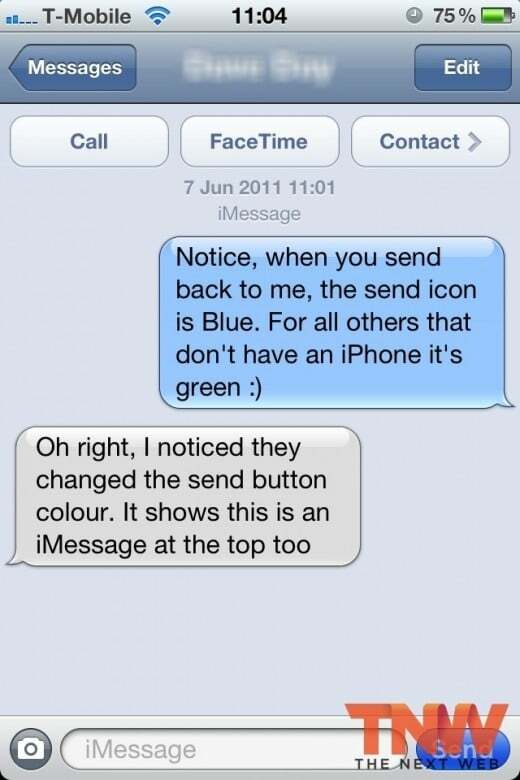 iMessage will allow you to send text messages for free to other people who are running iOS 5 on their device. For example, you will be able to send unlimited text messages to any of your friends, boyfriend girlfriend, or wife if they have an iPod Touch, iPad, or iPhone running iOS 5, and the text message will be completely free. So in short, iDevice+iOS 5=Unlimited text messages free. Cool, so how does this will actually work? iMessage is built into the native iOS’s Messaging app (the one you currently use to send texts message). iOS 5 will automatically detect if that person you’re texting is running on iOS 5, and automatically send the texts message as an iMessage. iMesage works using 3G data or WiFi so those message won’t be counted in your monthly bill plan. What kind of files can I send throught iMessage? Using iMessage you will be able to send texts, photos, videos, locations, and contacts.